a wedding, in this case in a tragic ceremony that happened to take place in Yemen, not Washington. On Sunday, April 22nd, planes from a Saudi Arabian-led coalition dropped two bombs on a wedding in Yemen. The groom was injured, the bride killed, along with at least 32 other civilians, many of them children. In response, the Saudis didn’t admit fault or express condolences to the victim’s families. Instead, they emphasized that their “coalition continues to take all the precautionary and preventative measures” to avoid civilian casualties in Yemen. This disconnect between Saudi rhetoric and the realities on the ground isn’t an anomaly — it’s been the norm. For four years, the Saudis and their allies have been conducting airstrikes with reckless abandon there, contributing to a staggering civilian death toll that now reportedly tops 10,000. The Saudis and their close ally, the United Arab Emirates (UAE), have repeatedly reassured American policymakers that they’re doing everything imaginable to prevent civilian casualties, only to launch yet more airstrikes against civilian targets , including schools, hospitals, funerals, and marketplaces. For example, last May when Donald Trump landed in Saudi Arabia on his first overseas visit as president, Saudi lobbyists distributed a “ fact sheet ” about the prodigious efforts of the country’s military to reduce civilian casualties in Yemen. Five days after Trump landed in Riyadh, however, an air strike killed 24 civilians at a Yemeni market. In December, such strikes killed more than 100 Yemeni civilians in 10 days. The Saudi response: condemning the United Nations for its criticisms of such attacks and then offering yet more empty promises. Through all of this, President Trump has remained steadfast in his support, while the U.S. military continues to provide aerial refueling for Saudi air strikes as well as the bombs used to kill so many of those civilians. But why? In a word: Saudi Arabian and UAE money in prodigious amounts flowing into Trump’s world -- to U.S. arms makers and to dozens of lobbyists, public-relations firms, and influential think tanks in Washington. Saudi Arabia’s influence over Donald Trump hit an initial peak in his first presidential visit abroad, which began in Riyadh in May 2017. The Saudi royals, who had clearly grasped the nature of The Donald, offered him the one thing he seems to love most: flattery, flattery, and more flattery. The kingdom rolled out the red carpet big time. The fanfare included posting banners with photos of President Trump and Saudi King Salman along the roadside from the airport to Riyadh, projecting a five-story-high image of Trump onto the side of the hotel where he would stay, and hosting a male-invitees-only concert by country singer Toby Keith. According to the Washington Post, “The Saudis hosted the Trumps and the Kushners at the family’s royal palace, ferried them around in golf carts, and celebrated Trump with a multimillion-dollar gala in his honor, complete with a throne-like seat for the president.” In addition, they presented him with the Abdul-Aziz al-Saud medal, a trinket named for Saudi Arabia’s first king, considered the highest honor the kingdom can bestow on a foreign leader. The Saudis then gave Trump something he undoubtedly valued even more than all the fawning — a chance to pose as the world’s greatest deal maker. For the trip, Trump brought along a striking collection of CEOs from major American companies, including Marillyn Hewson of Lockheed Martin, Jamie Dimon of JPMorgan Chase, and Stephen Schwarzman of the Blackstone Group. Big numbers on the potential value of future U.S.-Saudi business deals were tossed around, including $110 billion in arms sales and hundreds of billions more in investments in energy, petrochemicals, and infrastructure, involving projects in both countries. The new president was anything but shy in claiming credit for such potential mega-deals. At a press conference, he crowed about “tremendous investments in the United States... and jobs, jobs, jobs.” On his return to the U.S., he promptly bragged at a cabinet meeting that his deal-making would “bring many thousands of jobs to our country... In fact, will bring millions of jobs ultimately.” Not surprisingly, no analysis was offered to back up such claims, but it’s already clear that some of these deals may never come to fruition and many of those that do are more likely to create jobs in Saudi Arabia than in the United States. 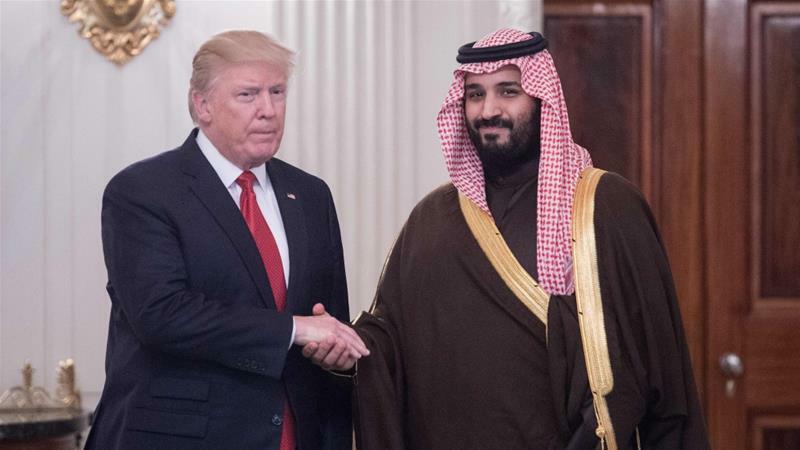 Still, President Trump’s love affair with that country’s royals only intensified, leading to a triumphant U.S. visit last month by Saudi Crown Prince Mohammed bin Salman, the power behind the throne in that nation. He is also the architect of its brutal Yemeni war, where, in addition to those thousands of civilians killed thanks to indiscriminate air strikes, millions have been put at risk of famine due to a Saudi-led blockade of the country. But neither of these activities that, Democratic Congressman Ted Lieu has noted, “look like war crimes ” nor Saudi Arabia’s abysmal internal human rights record drew a discouraging word from Trump or anyone in his cabinet. First things first. There were business deals to be touted — and so they were. As a start — as has been widely publicized — Jared Kushner, the president’s son-in-law and officially anointed point man on Middle Eastern peace (an outcome he is uniquely ill-equipped to deliver), has struck up a beautiful friendship with Saudi Crown Prince Mohammed bin Salman. Their relationship was solidified at a March 2017 lunch at the White House, followed by numerous phone calls and several Kushner visits to Saudi Arabia, including one shortly before the prince cracked down on his domestic rivals. Though that crackdown was publicly justified as an anti-corruption move, it conveniently targeted anyone who could conceivably have stood in the way of bin Salman’s consolidation of power. According to Michael Wolff in Fire and Fury, after bin Salman’s power play, Trump joyfully told Kushner, “We’ve put our man on top!” — an indication that Kushner had offered a Trump stamp of approval to the prince's political maneuver during his trip to Riyadh. Trump later changed his mind on this issue — after learning that Qatar hosts the largest U.S. military air base in the Middle East and after Qatar launched a PR and lobbying offensive of its own. That small, ultra-wealthy state hired nine lobbying and public relations firms, including former Attorney General John Ashcroft’s, in the two months after the Saudi-UAE blockade began, according to filings under the Foreign Agents Registration Act. Most notably, the Qataris agreed to spend $12 billion on U.S. combat aircraft just weeks after Trump’s tweet. Wherever Trump ultimately ends up on the campaign against Qatar (driven in part by a Saudi belief that its emir hasn’t sufficiently toed a tough enough line on Iran), Kushner’s role in the affair gives new spin to the old phrase "The personal is the political." According to a source who spoke to veteran reporter Dexter Filkins, Kushner’s antipathy toward Qatar may have been driven in part by anger over its unwillingness to bail his father out of a bad Manhattan real estate investment with a massive loan. Another snapshot of the Saudi-UAE urge to get up close and personal with The Donald lies in the strange caseof George Nader, a political operative and senior advisor to the UAE, and Elliott Broidy, who reportedly can get face time with President Trump as needed. Nader evidently successfully persuaded Broidy to privately press Trump to take positions ever more in line with Saudi and UAE interests on Qatar and in their urge to see Secretary of State Rex Tillerson head for the exit. Whether or not Broidy’s appeals were instrumental in Trump’s decisions, he can’t be faulted for lack of effort. His exploits underscore how far both countries are willing to go in their efforts to bend U.S. foreign policy to their needs and interests. The keynote speaker at that conference was House Foreign Affairs Committee Chairman Ed Royce, who then crafted a sanctions bill against Qatar and — miracle of miracles — shortly thereafter received a campaign contribution from Broidy. Wherever those funds came from, it strains credulity to believe that this was all coincidental. To sweeten the deal, Nader also dangled the prospect of major contracts for Broidy’s private security firm, Circinus. One deal with the UAE, for $200 million , has already been sealed, while a Saudi one is in the works. At this point, who knows whether any of this was illegal, but in the world of Washington influence peddling, what’s legal is often as scandalous as what’s not. If such deep connections between Saudi Arabia and the Trump administration sometimes seem to surface out of nowhere, they all too often stem from an extraordinarily influential, if largely unpublicized, Saudi lobbying and public relations campaign. Following the November election, the Saudis wasted no time in adding more firepower to their already robust influence operation in this country. In the less than three months before Trump was sworn in as president in January 2017, the Saudis inked contracts with three new firms: a Republican-oriented one, the McKeon Group(whose namesake, Howard “Buck” McKeon, is the recently retired chairman of the House Armed Services Committee); the CGCN Group , a firm well connected to conservative Republicans whose clientele also includes Boeing, which sells bombs to Saudi Arabia; and an outfit associated with the Democrats, the Podesta Group, which later dissolved after revelations about its work with Paul Manafort, Trump’s former campaign manager, and Russian banks under sanction. Before Trump even made it to Riyadh that May, according to an analysis of Foreign Agents Registration Act records, the Saudis signed contracts with six more public relations firms and then added two more immediately after severing diplomatic ties with Qatar in early June. All told, in just the first year of the Trump administration, the Saudis spent more than a million dollars monthly on more than two dozen registered lobbying and public relations outfits. The UAE was not far behind, boasting 18 registered lobbying and public relations firms in 2017, including more than $10 million dollars that year alone that went to just one of them, the Camstoll Group. All this lobbying firepower gave those two countries an unparalleled ability to steer U.S. foreign policy on the Middle East. Among other avenues of influence, their campaign included a steady stream of propagandaflowing to policymakers about the war in Yemen. Large foreign lobbies of this sort also enjoy an even more direct path to influence through campaign contributions. While it’s illegal for foreign nationals to make such contributions in U.S. elections, there’s an easy workaround for that — just hire lobbyists to do it for you. Such firms and figures have, in the past, admitted to serving as middlemen in this fashion and are known to have sometimes given handsomely. For example, astudy by Maplight and the International Business Times found that registered lobbyists working at just four firms hired by the Saudis gave more than half a million dollars to federal candidates in the 2016 elections. Another important avenue of influence for the Saudis and Emiratis: their financial contributions to Washington’s think tanks. The full extent of their reach in this area is hard to grasp because think tanks and other non-profits aren’t required to disclose their donors and many choose not to do so. However, an eye-opening New York Times exposé in 2014 revealed an expansive list of think tanks that received money from the Saudis or Emiratis, including the Atlantic Council, the Brookings Institution, the Center for Strategic and International Studies, and the Middle East Institute. In the age of Trump, it’s a reasonable bet that it has only gotten worse. There is much concern in official Washington about Trump’s seemingly cavalier attitude towards longstanding U.S. alliances, but in the case of Saudi Arabia, a major change of course would undoubtedly be advisable. The least we can do is help make sure that the people of Yemen don’t fear for their lives at their own weddings. The above originally appeared at Mises.org/. The Israelis and now the Saudis apparently have caught on to how easy it is for them to manipulate Trump.